Last week we released an update to CodeTwo Exchange Migration and CodeTwo Office 365 Migration, our mailbox migration tools for Exchange Server and Office 365. Apart from fixing some minor bugs, we have also added new important features. One of the most important changes applied in this release is the possibility to filter out mailbox items according to their modification time – so called time filters. Time filters let you choose items for your Exchange or Office 365 migration according to their modification time. They are a part of the source server connection wizard. They give you a choice whether to migrate items older, or not older than certain date. For instance, you can choose to only migrate data from the last 30 days. 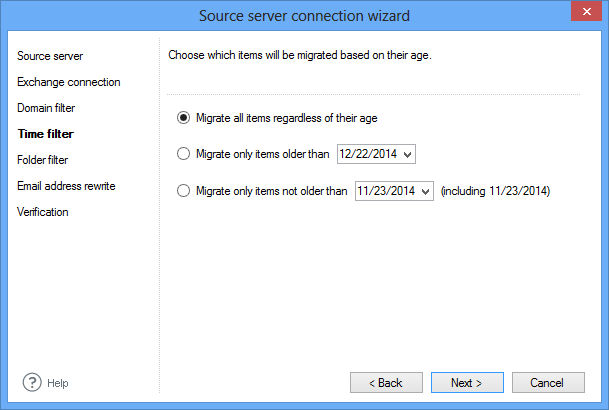 How to use the new feature in CodeTwo Exchange Migration and CodeTwo Office 365 Migration? Obviously, there is a number of scenarios in which such feature can be utilized, but one of them can be especially helpful. Considering how time consuming the entire migration project can be, administrators may want to enable the mail flow on the new mail server as soon as possible and let users work on new mailboxes almost immediately. One of the ways to achieve that is to divide the migration into two batches: one to copy only mailbox data from the last 30 days, the second (more time consuming) – for moving the items from the remaining period. The new time filters in CodeTwo Exchange Migration and CodeTwo Office 365 Migration from now on fully support such a migration approach. How to migrate to another Exchange Server or Office 365 in batches? Let’s imagine we are preparing a migration from Exchange 2003 to Exchange 2013. Since those two versions of Exchange Server can’t co-exist in one forest, this will be a cross-forest migration by default. Thanks to CodeTwo Exchange Migration we will be able to migrate mailbox data directly from Exchange 2003 to Exchange 2013, avoiding the “double-hop scenario”. No Exchange 2007, or Exchange 2010 pre-installations are required. you would like to migrate from Exchange Server to Office 365, please download CodeTwo Office 365 Migration and use these instructions accordingly with Exchange Online as a target. After installing CodeTwo Exchange Migration in the source Windows domain, we need to configure the source server connection. The connection wizard will guide us through the process. First, we are asked to provide the Domain Admin’s credentials and pick the domain (if more than one are available). 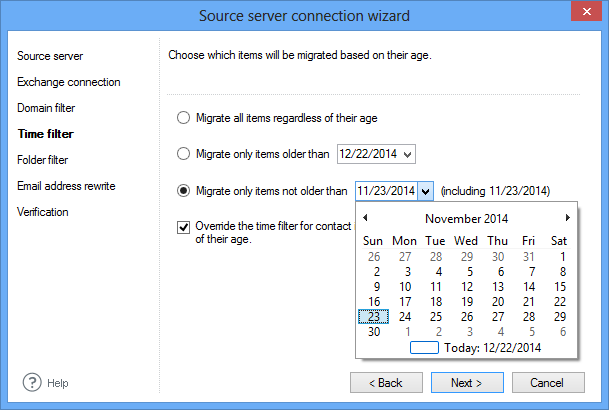 Then, the source server connection wizard brings us to the crucial part of the configuration – the time filter. This is the place to choose from which time period mailbox items are supposed to be migrated during the first migration batch. As we want to migrate only the last month of data first, let’s choose the last option and select a proper cut-off date. In our case this will be the last 30 days. Next off is the folder type filter. 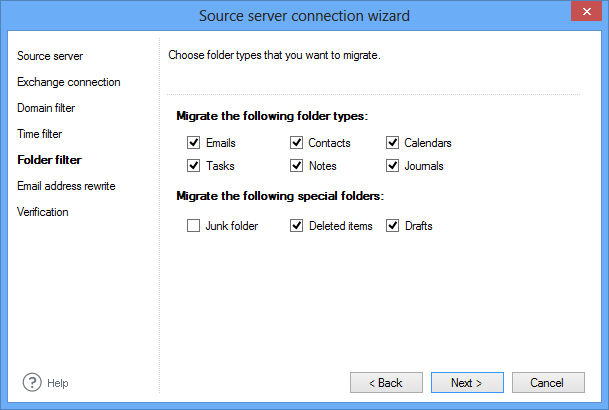 CodeTwo Exchange Migration lets you choose the types of mailbox folders that you wish to migrate. For the purpose of this example, let’s leave this window in the default setting. 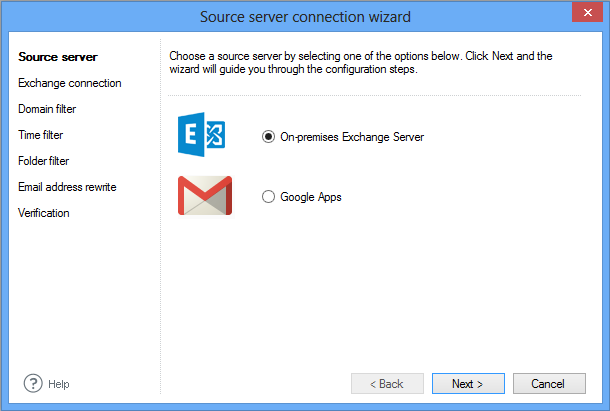 After verifying the source connection, the wizard will prompt us to configure the target server connection and match the source mailboxes with the corresponding users in the target Exchange 2013 installation. As soon as the connections are verified and mailboxes are matched with their target locations, we are free to launch the first migration batch. It can start immediately (by using the Start button), or scheduled to be launched later on (the Scheduler feature). The time of the migration depends on the amount of data that needs to be copied as well as the network performance. As soon as the program finishes the migration of last 30 days of data, we can switch the mail flow to the new Exchange Server installation, meaning the MX records of the DNS zone can be switched to the new mail server. After doing so, users will be able to send/receive messages as usual, but they will only have access to the last 30 days of historical data, as per our migration configuration. The rest of the mailbox items will be migrated live later on, while they will be using their new mailboxes. Since CodeTwo Exchange Migration operation generates no impact on users, the migration of the remaining data will not affect their everyday work. CodeTwo Exchange Migration is equipped with a handy Rescan feature which runs a so called “delta migration”. This process involves comparing the source and target environments’ in search differences and migration of the missing data. In order to use this feature in our scenario, we need to turn off the time filter in the source connection settings we applied previously. To do so, we need to launch the source server connection wizard again and select the first option in the fourth step. After saving these settings and clicking on the Rescan button the program will migrate the missing elements avoiding the creation of duplicates at the same time. The scenario described above is only an example of how the time filters can be used during an Exchange or Office 365 migration. If you are curious how these tool perform live, simply download the trial version and test it in your environment.